Atheodox Jew: What Exactly Is "The Power of Tehillim"? What Exactly Is "The Power of Tehillim"? "David Hamelech's kavanot [meanings/intentions] are already there in the Tehillim. You don't even have to understand what you're saying. That's how powerful it is." The Tzemach Tzeddek [3rd Lubavitcher Rebbe] once told his chassidim, "If only you knew the power of Tehillim, you would recite them at all times. Kapitlach of Tehillim break all barriers and bow before Hashem, bringing results with kindness and mercy." 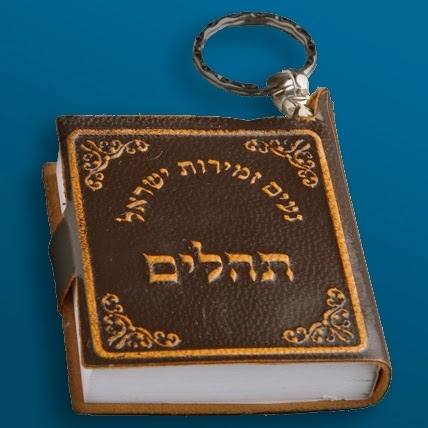 If people only knew the power of Tehilim they would read it all day long, seven days a week! Reading Tehilim on a regular basis can open up the gates of heaven and change a person's situation in life for the better. Its meanings inspire positive change in us, and we in turn effect positive change in the world. Its words resonate with our life experiences and help us to articulate our feelings. It helps us transcend the mundane in daily life - e.g. by saying Tehillim while riding on a bus. It gives us something to "do" - and therefore offers comfort - when we feel helpless during difficult times. When said as part of a group, it lends a sense of solidarity, pulling us together as a community. It gives hope to the people it's being said for. It instills a sense of compassion and mutual responsibility within those who say it. It strengthens our emuna (faith). It gives us zechut (merit), which can potentially "tip the scales" in Shamayim when our fate is being decided. The words themselves have a power to effect changes in the Higher Realms. And these aren't mutually exclusive. Religious people certainly appreciate the psychological and communal effects - the idea of "working on ourselves" and cultivating compassion for one another. At the same time, they generally agree that Tehillim does something "out there" as well - and that's what I find people typically refer to when they invoke the idea of "power". But in my experience, most people have only the most vague sense of what that power is - whether it's more like #2 or #3 above and how that actually works. No matter how distressing the situation, Tehillim has eased the pain and achieved miracles. A story is told in the sefer Chesed L’Avraham about an entire city that was kept safe for years because of a single man’s recitation of Tehillim every day... Our experience has shown that Tehillim has accomplished wonders, astounding the doctors of our patients time and time again... The power of so many prayers will surely evoke a heavenly response. What does that mean, "evoke a heavenly response"? Evoke - as in bring about or conjure, or influence the decision-making process? Heavenly - as in Hashem, a larger heavenly court, or the metaphysical plumbing on high? Response - as in action-reaction, spiritual mechanics, or response in the sense of an "answer"? It's like the proverbial "How many angels can dance on the head of a pin?" The more you talk on the topic, the more foolish it sounds. So it's left deliberately vague. But that's not to say that the inability to offer a coherent explanation is viewed as a problem or that it casts the belief itself into doubt. Just the opposite - it feeds into the "other-worldliness" of it, the sense of majesty and mystery, unknowability, a shining example of "For my thoughts are not your thoughts, neither are your ways my ways". So expressing vagueness and a lack of understanding might actually be termed a kind of "piety" in cases like these. Now, my intent here is not to demean the idea of saying Tehillim, organizing Tehillim groups, etc. Even if people have only tenuous notions of what they mean when they say it's "effective" in the metaphysical or theological sense, the fact is - it is effective for all the psychological and communal reasons. And I also recognize that people's mystical/theological beliefs themselves have power - the power of hope, which can make a tangible difference in people's lives. So I'm torn. On the one hand, if challenging people's spiritual claims about Tehillim would lessen the positive effect it has, who am I to do that? Would I likewise go into a homeopathy clinic and tell patients who say they're benefiting from it that the whole notion behind homeopathy is ridiculous? We're talking about people's lives and health at stake. It may be the "placebo effect", but the placebo effect is very real and very powerful! On the other hand, kavod ha-Torah (the honor of Torah) and consequently "kavod of the mind" are on the line here. Do I just stand by and not say anything about beliefs which are patently false as long as it "works" for many people? And let that pass for "Torah"? Let Torah - and everyone affiliated with it - be derided as superstitious and backwards? Not on my watch! Obviously this question goes to issues of religious belief in general. And honestly I don't have a one-size-fits-all answer. Or maybe my answer is that we shouldn't have an absolute position in such matters. Life is complex, and requires nuance and sensitivity. As I've said many times before, people have to come before ideas. You don't ruin lives in order to make a point. But... There has to be a place to make a point. Which is why I said toward the beginning of the post that I challenged my friend "gently". I didn't want to hurt him, but I also felt compelled to say something. So I suppose the best policy is (and really I'm telling myself this as a sort of mantra): Use thy best discretion! See this lady's post and the subsequent comments from SBW. Thanks for the link. The thread actually gets into some issues I decided to leave out of this post for brevity's sake, in terms of beliefs regarding the "spiritual mechanics" of prayer. When you get down to it, for most people who believe their prayers "do something", it's because they believe their words (to use the blogger's phrase) "travel up to heaven". Yes, there are important psychological/social benefits, but I doubt people would be nearly as motivated to pray if that were the extent of it. > Its meanings inspire positive change in us, and we in turn effect positive change in the world. I’m a fan of the propaganda theory of prayer. Within the framework of OJ, why do we pray? God doesn’t need us to pray to Him, nor is He likely to re-arrange the universe simply because we ask. Besides, most of davening is telling God how great He is, not asking for things. So I think the point is to instill in us a sense of God’s greatness and influence on the world, and thereby inspire us to act accordingly. > What does that mean, "evoke a heavenly response"? You’re trying to understand how a fuzzy feel-good idea works in the real world. People who believe in it never do that, because once you peek behind the curtain the useful illusion falls apart. > Would I likewise go into a homeopathy clinic and tell patients who say they're benefiting from it that the whole notion behind homeopathy is ridiculous? Yes, you should, because people use homeopathy in place of real treatments that have a chance of helping them. Tehillim poses less of a danger, because it isn’t usually substituted for visits to the doctor. When it is used in place of practical measures, though, it becomes dangerous and should also be discouraged. prayer like many other theological issues boils down to y should something be considered true if it has no evidence? should something be considered true if it has no evidence? This is an interesting question. First off, there's the question of evidence vs. faith. Some might say that having "faith" that something is true is a more authentically religious position than having "evidence" that something is true. But my guess is that most people's faith is based on what they perceive to be evidence. For instance, how many hundreds of thousands (millions?) of people would tell you about personal experiences they've had involving some sort of encounter with the Divine which was so powerful that they're convinced in the truth of it? My experience is that most peole reciting t'hillim don't understand what they're saying. How many of the 10 powers that you enumerated does this disable? And of course 10 is very nice round and mystical number. shekoyach. Hmm... Well it would definitely knock out numbers 1 & 2. But numbers 3-8 still hold up. 9 & 10 probably depend on your understanding of theology and mysticism. The author of the essay you linked to has commented on my blog before. See here: http://atheodoxjew.blogspot.com/2014/05/the-first-cause-bait-and-switch-scam.html. 1. It's absolutely true that rational inquiry can lead to doubts, and those can lead a person away from Torah. But (a) to prevent or even discourage a person from pursuing his/her own inquisitiveness is frankly to be cruel - it is to curtail part of what it means to be human. (b) If we do not think that Torah can stand up to rational inquiry, that doesn't put Torah in a particularly good light, does it? (c) My efforts have been to present Torah and observance in such a way that we don't have to be frightened in the least in the face of knowledge and common sense - two things which we should want to *embrace*, not reject. 2. About logic impairing our ability to recognize "self-evident knowledge," I admit I'm very wary of this. Human beings have deep intuition, and intuition is a mixed bag. Sometimes it's correct, and other times it's terribly misguided. The mind can and DOES fool us. Many times, we have to outsmart ourselves not to be fooled. From ground-level, the earth does "self-evidently" seem flat, does it not? So the fact that we intuitively perceive a "soul" when looking into someone's eyes, or that we intuitively see the world as having been intelligently created (the latter of which is definitely influenced by cultural beliefs as well) does not mean these things are objective realities. 3. I agree with the idea of maintaining humility. But let me ask you - what is more humble: saying with absolute certainty how it is the universe came to be, what happens after we die, what happens on theoretical spiritual planes if we do or do not keep the Torah, the nature of God and providence, etc., or saying "I don't know" and simply being open to what we discover? Rational inquiry does NOT mean being arrogant. We know our knowledge is limited, and that more knowledge leads to more and deeper questions - which merely makes us curious to learn and understand more. That, in my estimation, is a wonderful thing! Rational inquiry does NOT mean the person lacks awe and wonder about the universe. In my experience it is precisely the opposite! And rational inquiry does NOT mean "longing for money, honor, etc". This is a common misnomer brought by religious believers. Both believers AND nonbelievers can be nobles or scoundrels, compassionate or cruel, highly principled or corrupt. Religious belief is not the great scourge of the world that atheists make it out to be - and neither is rationalism the "disease" that others make it out to be. you misssed the point. rationalist inquiry is good provided one accepts the truth of the torah first. but one who believes ONLY what he understands will go off and be fooled by his own yetzer. you are living proof of this. Yes, reciting psalms is a placebo. As such, the practice has no tangible benefits. Rather, the (possible) benefit would be the placebo effect of providing the supplicant with sense of hope. The resulting reduction of anxiety could then lead to a real benefit. So if the psalm reader is getting a benefit, we shouldn't spoil the fun and thereby cause some damage? The problem with this line of thinking is that there is indeed a price to be paid by enabling the false belief. The effort and emotional energy that is invested into the placebo could have been instead invested into the reality of the unfortunate situation at hand. The placebo can act as a barrier to true inner peace that can only be obtaining by accepting reality. Blogs I look at, comment on, or who were kind enough to link to me. Question! About "BT Shelf Life". . .